PTA believes all students deserve the opportunity to take part in the arts, both in school and in the community. The arts can positively affect entire school culture—especially student motivation, attitudes, and attendance—which encourages students to stay in school, succeed in school, succeed in work, and succeed in life! Help PTA ensure that every child has access to-and takes part in-high quality arts learning experiences. Apply for the Mary Lou Anderson ArtsEd Grant and explore the ArtsEd Toolkit to grow family and community engagement for arts education at your school. In line with Mary Lou Anderson’s vision of access to the arts education, this grant opportunity places special emphasis on increasing access among at-risk and underserved students. It is National PTA’s hope that this grant opportunity will serve local PTAs that demonstrate a commitment to providing new pathways for students to participate in National PTA’s Reflections program and increasing at-risk student's access to high quality arts learning experiences. Apply by 11:59 PST on Sunday, June 30, 2019. Applicant must be a PTA in good standing, as determined by the State PTA. Project must occur between August-November 2019. Description of $1,000 in grant-funded expenses for teacher and learning resources/supplies. Description of process to obtain $1,000 in matching contributions from school/community partner. Recipient must complete a post-project survey by December 16, 2019. Consider this EXAMPLE application as you prepare your own application for this grant opportunity. Increase student access to ArtsEd opportunities. Secure ArtsEd resources for students and teachers. Strengthen family and community relationships with schools. 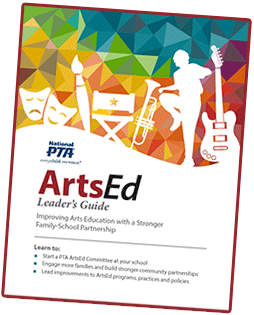 Share Resources: Use our PTA ArtsEd Leader's Guide and Appendices to share resources with parents to support their child’s interest in the arts. Speak Up for Arts Education: Using a powerful PTA Position Statement and Resolution, your PTA can show important support and enthusiasm arts education. Host a Creative Career Fair for Families: Invite families to learn about how artistic literacy translates into college and career readiness. Learn how using the PTA Creative Career Fair Guide. Host a Reflections Awards Program for Students: Spark creativity and celebrate participation and achievement in the arts with the whole family. Learn how using the PTA Reflections Tools. Enroll in the National PTA's School of Excellence Program (May 1 - Oct. 1): Strengthen family-school partnerships in support of arts education and gain national recognition for excellence in family engagement. Learn more about National PTA School of Excellence. Join our National Celebrations: Share your PTA's support for arts education. Use #PTAReflections on Facebook, Twitter and Instagram and share your #PTAProud story with us. Explore One Voice blogs and Our Children Magazine articles about arts education. Americans for the Arts envisions a country where everyone has access to-and takes part in-high quality and lifelong learning experiences in the arts, both in school and in the community. Learn about new ways to support the arts during National Arts in Education Week and National Arts and Humanities Month. Find connections and partnerships in the Arts Education Field Guide. Browse the Arts Education Navigator Series and grow your confidence as a PTA ArtsEd Leader. Share these family activities. Arts Education Partnership helps PTA to advance arts education and lead the way to student success with current research and policy insights. Visit ArtScan to learn about state education policies supporting arts education. ake your case for arts education with the help of ArtsEdSearch, a research and policy database providing summaries on academic, cognitive, personal, social, and civic outcomes for students of arts education. Our national program supporters offer access to regional and state level arts education experts.